Basil Lettuce Leaf Ocimum Basilicum is a sun-loving, annual herb that can be easily grown from Basil seeds. Lettuce Leaf Basil is bushy, vigorous plant with giant, slightly serrated and crinkled, 4 inches wide and 6 inches long, lettuce-like leaves. This well-branched Basil with dense foliage is the most productive variety of all basils, and when it blooms in summer, its scented white flowers attract masses of bees and butterflies. There is nothing like the smell of basil - one of the most recognized fragrances of summer. Basil Lettuce Leaf is the ornamental herb which is a natural pest repellant in the garden, and Basil is a popular choice for outdoor planting in containers, pots or for growing indoors on a sunny windowsill. Ocimum Basilicum seeds germinate fast producing rapidly growing herb that thrives in a fertile, well drained soil. 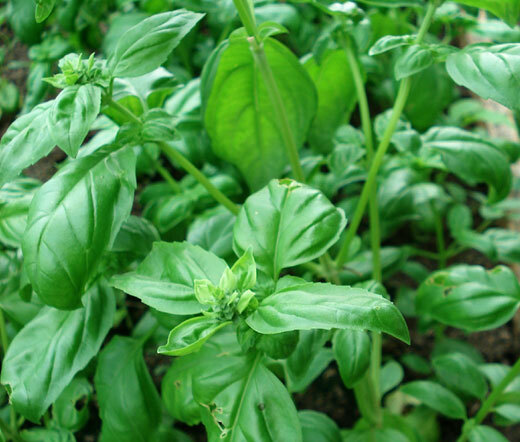 The several cuttings may be obtained, and Basil must be cut 4-6 inches from the ground to permit re-growth. Lettuce Leaf Basil has a lot of culinary uses - Its fresh leaves are excellent in salads and not overpowering as some other varieties can be. The highly aromatic leaves have a pleasant spicy odor and taste somewhat like anise or cloves, and both the leaves and their essential oils are used as flavoring agents.